This is a series of four novellas, the first two of which I’ve already reviewed, but I wanted to make at least a little post about the final two, which have now come out and complete the character arc. They are so good! They each stand alone, but they also all work together to be greater than any one part. They’re also somewhat reassuring in the way that they are set in a dystopian universe but is still pretty blasé about the whole thing. The characters are trying their best, mostly, and while things do go well, mostly, it’s not world changing, except for the main individual who’s trying to figure out its own place in the world. Life continues on, self-discover continues on, even when you’re wandering around in a world of corporate control and violent greed. And sometimes you can still have a realistically happy ending. These are the first two stories in the Murderbot Diaries series, which I understand is intended to be a series of four stories, with the remaining two stories due out in August and October, respectively. I am so excited! All Systems Red won the Nebula Award for best novella in 2017, which is particularly awesome to me since I had read it before then. These are really fabulous stories, and one of the rare examples (in my ever so humble opinion) of successful use of first person narrative. And one of the real benefits of the first-person narration is that Murderbot is sexless and genderless, and while the writing addresses that specifically, the lack of a standard non-gendered third-person pronoun in English isn’t a problem because it obviously refers to itself as “I”. Our protagonist also refers to itself as a Murderbot, although the official designation is “SecUnit”, standing for Security Unit. The more I think about it, the more complex and on point the message becomes in using the term “Murderbot” instead. We are told that SecUnits have governance modules to that keep them controlled and when those governance modules fail, the units will go on essentially murderous rampages seeing everything and everyone as a security risk to be addressed with maximum force. Our protagonist, however, has hacked its governance module and spends its free time downloading media and keeping itself entertained. It performs its assigned tasks, just now by choice (or lack of interest in dealing with alternatives) rather than through direct control, and watches a lot of space opera TV shows. But then, of course, plot happens, and it turns out that having the freedom to make nuanced decisions rather than follow specified algorithms with pre-set decision trees is actually a real benefit in providing quality security to individuals under attack. So far, each of the two books has its own plot with characters who need security, but the greater plot arc across the series seems to be figuring out Murderbot’s history and the possibly the nature of SecUnits. But all in all, it’s a delightful character study with some interesting plot. I highly recommend. So, it’s possible that I overdosed slightly on Martha Wells. After reading all three of The Books of the Raksura, I went immediately to the library and got Wheel of the Infinite, and after reading that, I went back and got all three books of The Fall of Ile-Rien. 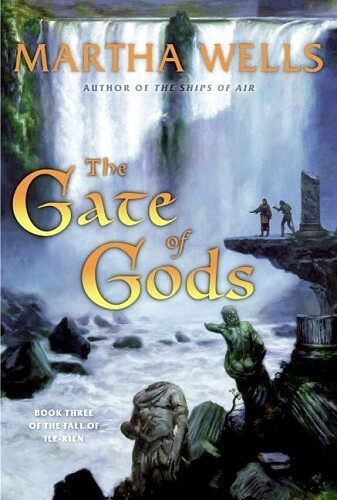 I loved each and every one of these books, but by The Gate of Gods, I was flagging a bit and needed a break. However! It’s still really good and I want to read the prequels, The Element of Fire and Death of a Necromancer. I’m just aware that it’s probably a good thing that the library doesn’t have them and I’ll have to take a break to figure out how to get them through inter-library loan. Anyway, this series starts off with a ludicrous mess of a plot that I wouldn’t have bothered reading by an unknown author. However, as I’ve mentioned before, Wells has an amazing ability to bring new life to old tropes and she does it extremely well here. 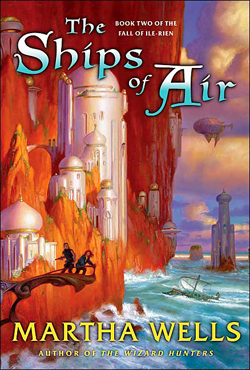 There’s a lot going on in these books: the kingdom of Ile-Rein is sort of like a magical version of a 1920s Europe, but is currently being attacked by (and losing to) an invading army that appears to come from nowhere. Tremaine Valiarde, our heroine, is from this world. It turns out the bad guys, though, are invading from a different world, although tracking exactly how is a main plotline for the series. Ilias is from a more agrarian society in an entirely different world. Also his society is a matriarchy, which allows Wells to be delightful in her exploration of gender norms and social expectations. Normally, the thing that most attracts me to a book is the world building, but while the world building here is excellent, it’s really the characters who shine. 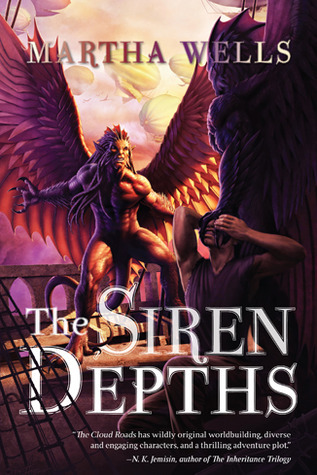 Both Tremaine and Ilias are broken in their own ways, but also too strong to let that stop them. And while they’re not outcasts from their respective societies, neither of them quite fit in at home. Wells does an amazing job of showing how out of sync both of them are, even with their friends and family, and yet those same idiosyncrasies allow them to fit together in a way they don’t with anyone else. Plus, I just really love how Wells approaches bringing them together. Some things simply appear impossible: there’s a war going on, there’s no time for relationships. Other things are so easy and without angst for much the same reason: there’s a war going on, no need for unnecessary waffling. But for all that Tremaine is clearly set up as the central character, the real main character is the war itself. It is ever-present and affects everything that happens. There is a large cast of characters who are all struggling to do their best to achieve their goals, because the war doesn’t effect just one person and can’t be fought by just one person. There are dozens of main characters, all working, either together or in opposition, but all with the knowledge that something needs to be done and no one has the option to sit out these events. I really liked this series a great deal. I think I might have a new favorite author, as well. 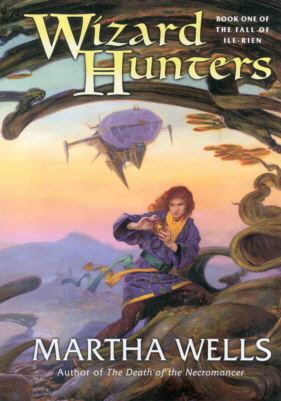 Having thoroughly enjoyed The Books of the Raksura by Martha Wells, and going through a bit of withdrawal from reaching the end of the series, I checked out an older book of hers and am extremely glad I did so. Maskelle is The Voice of the Adversary, a highly ranked priestess, but she was exiled (rightly so) for murder and treason some years back. She has been summoned back to the Imperial and religious center of the land by the request of the Celestial One to help regarding a problem with the Hundred Year Rite, in which the Wheel of the Infinite recreates the world. (A problem with the re-creation of the world is, rather obviously, quite a problem.) But she approaches the people and the magic with deep familiarity and deep discomfort given her past. Rian is a bodyguard from a far distant land who ran away from an unpleasant situation, and manages to fall in with Maskelle on her return trip, and sees the political and religious situation with fresh eyes. And that is the premise. From there, stuff happens: after all, there’s a problem with the ritual that recreates the world. Stuff. Happens. I love the exploration of the world that is inherent in our main characters’ investigation of what has happened. In addition to the amazing world-building, I also just love the characters. Rian’s culture shock is somewhat hilarious (especially as it mirrors the reader’s own shock at this culture). And Maskelle’s deadpan practicality, even as she struggles with her own issues, is a delight. 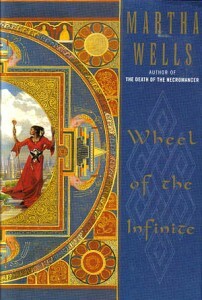 The first chapter of Wheel of the Infinite is available online, so you can get a taste. I highly recommend this book. Please, please, let there be more coming soon! 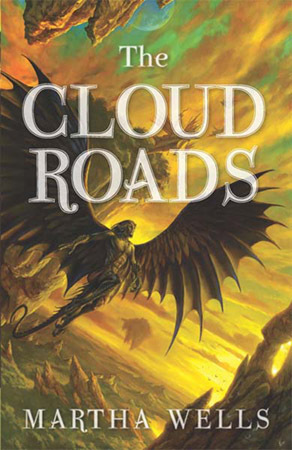 So I started reading The Cloud Roads on the recommendation of an online friend and thought it was decent but not fabulous. My ambivalence was mostly due to the fact that most of what should have been unique about the world building, I’d seen before in either George Lucas’ Star Wars or in Bujold’s Sharing Knife series. The characters seemed a trifle flat, although nothing out of the ordinary when the focus is on world building. The plot and character interactions were still fun, and I enjoyed it enough to check out the second book. Half way through the second book, I put a request in at my library for book three. Then I finished book two, which ended perfectly satisfyingly with no cliff-hanger in sight, and yet I still desperately wanted to see more of these characters and this world, both (all?) of which had finally come into their own. And then the third book was just as awesome as expected. Awesome! And now I want more, more, more! Anyway: the world Wells created is a complex one with an unknown number of sentient species all living in their own communities and groups, but also very much interacting. The bar in Star Wars, where Luke and Kenobi meet Han Solo would not be out of place in one of this world’s cities. Our main character, Moon, is introduced while living with yet another group of people, trying to fit in with a species not his own. The trouble is that Moon doesn’t know what species he is. He lived with only his mother and siblings before he was able to care for himself, and they all died when he was still quite young. In The Cloud Roads, the first book, Moon discovers his own people. Or rather, he is discovered by his own people. 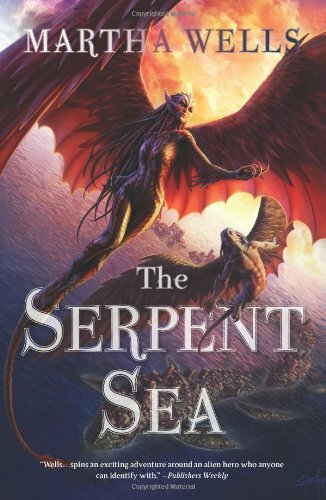 In The Serpent Sea, Moon settles in and finds his place among his own kind. And in The Siren Depths the comfort that he has found is challenged. One of the things that particularly impresses me with Wells is the way she introducing the reader to a person and a culture who are decidedly not human and yet are completely sympathetic. Each book adds more layers of complexity and subtlety over the cultures and individuals, making them increasingly enthralling. I also love the way Wells plays with gender roles and how societal expectations vary from society to society and how even societies with established hierarchies always have to deal with a few exceptions. And Moon, as both our main character and an outsider to all societies, gives the reader a wonderfully bemused perspective on it all. Overall, they’re just kind of adorable books with wonderfully nuanced takes on some standard tropes. And I really hope there’s more soon.